Let’s start with the little-known “Netflix, Inc. (NASDAQ:NFLX) of China” that is IQiyi, Inc (NASDAQ:IQ). I feel really lucky to have stumbled upon this stock after someone on Twitter Inc (NYSE:TWTR) flagged it down a few weeks ago. After I dug through the key numbers in its prospectus (it’s a recent IPO), the growth was too strong and the market cap was too low to ignore. In fact, we pointed it out on InvestorPlace when it was at $20.50 just a few weeks ago! Lately it’s been off to the races, up almost 25% this week alone! Where do investors go from here? Unfortunately, I don’t think we can blindly chase it. In its brief history, it has shown that it tends to consolidate after a move higher. Although as more momentum traders stumble upon it, those rallies and pullbacks will likely become more extreme. I would look to buy pullbacks in IQ as opposed to selling rallies because of how much growth its underlying story has (with some of that highlighted in the link above). I like this story here and would start to nibble on a pullback into the $25-ish range. Lululemon Athletica inc. (NASDAQ:LULU) reported solid earnings and exploded to new all-time highs on Friday. While the move is promising for existing bulls and long-term shareholders, traders should take a pass on this one. The relative strength index (RSI) measures how overbought or oversold a stock is, with north of 70 being considered overbought (on the chart above, it’s in yellow circles). The higher the number goes, the more overbought it is. I don’t base my thesis around an RSI reading, but I do take it into consideration. Now near 90, LULU is pretty well overbought as it’s up more than 50% so far in 2018. 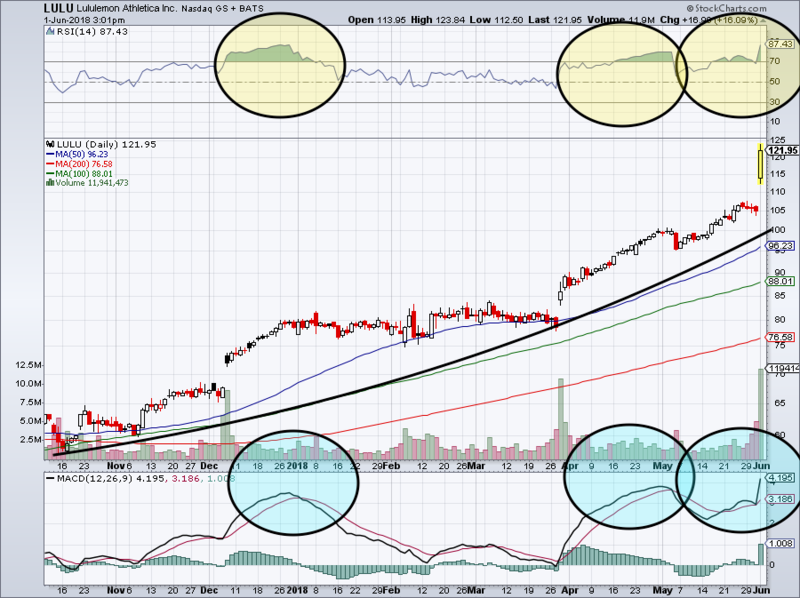 But as shown by the last two times the RSI was elevated, it doesn’t mean an impending collapse is coming for LULU. If I were long LULU I’d book some gains at this point and I wouldn’t bother trying to short. I certainly wouldn’t take a new long position today. I guess I’m just Johnny Raincloud today, but like Lulu, I don’t think traders should be loading up on Twitter right now. We made it clear bulls could buy a breakout over $32 less than one month ago. 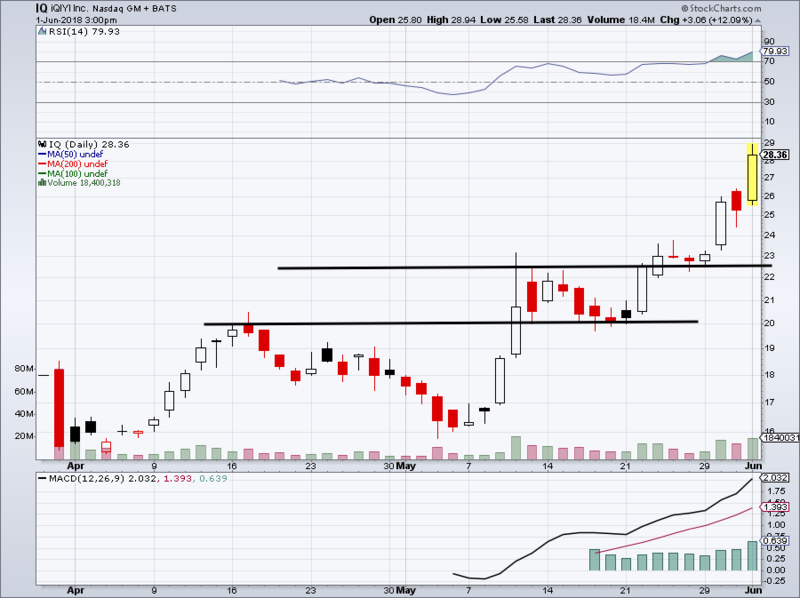 Now near $37, Twitter is up more than 15% and is coming into some potential resistance. 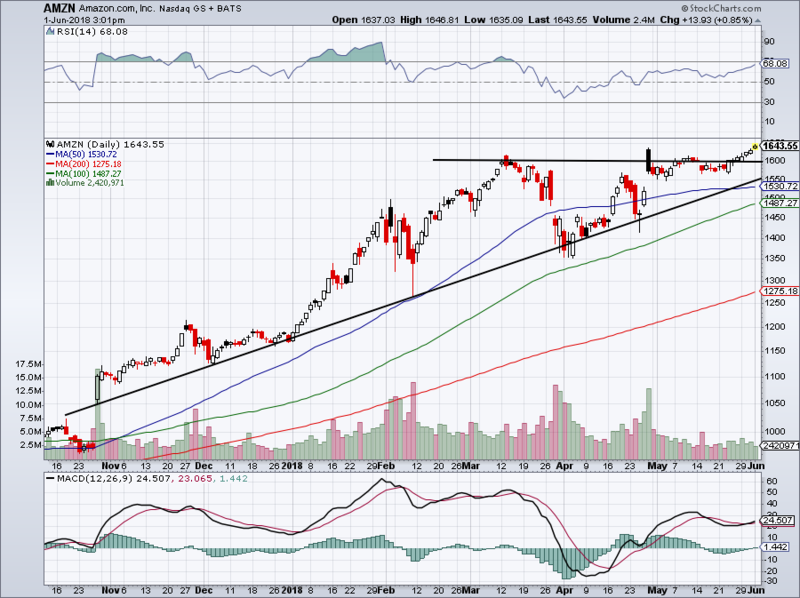 With an elevated RSI, Twitter could easily fail to push through $37 and opt to consolidate — possibly just over $34. I wouldn’t call that a bearish development necessarily, but I wouldn’t chase TWTR right here, right now on the hope it will get through on the first time. 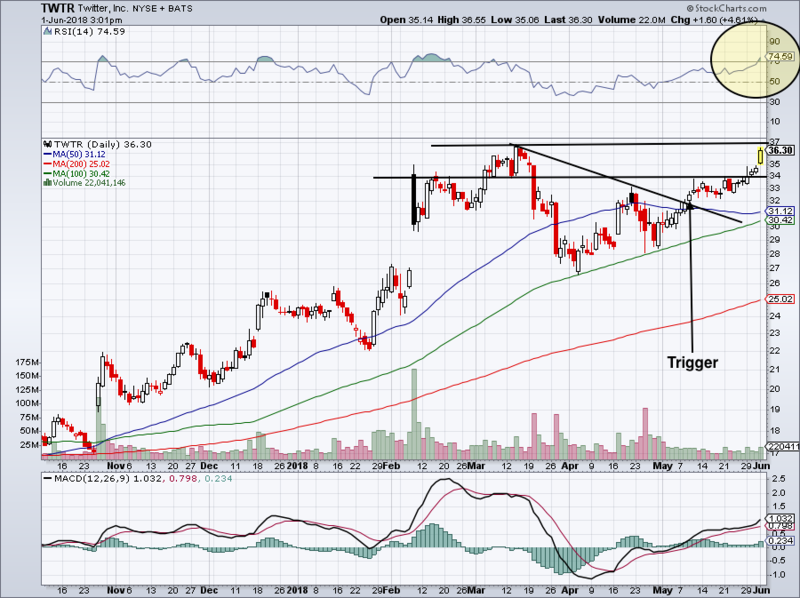 If Twitter does breakout, bulls can buy on a close over $37. Other than that, wait for a better price. With its almost $800 billion market cap, we can’t not talk about when the country’s second-largest company hits new highs. But that’s exactly what Amazon.com, Inc. (NASDAQ:AMZN) did on Friday. As long as Amazon can stay over this $1,600 level, I like it on the long side. Should it falter, I also like AMZN on a pullback to trend-line support, a rough estimate of which puts it between $1,500 and $1,550. Amazon stock is in a solid up-trend while Amazon’s businesses operate in long-term secular trends. You can short it on valuation — something that’s never bound its price before — but only if you’d like to get run over. Keep it simple: Buy Amazon on dips or get out of its way. If the second-largest U.S. company is making new highs and we’re talking about it, how can we avoid talking about Apple Inc. (NASDAQ:AAPL)? Okay, okay, shares didn’t notch a new all-time high Friday. But they came pretty darn close. It’s hard to see a stock go from ~$160 to the upper-$180s in a few days, consolidate for nearly a month and not be excited. Bulls should look for an eventual break out of the rectangle drawn above. Essentially, a powerful close above $190. Wall Street analysts keep taking their price targets higher and its because Apple is simply a darn good company without a premium valuation. Plus, it’s buying back $100 billion of its own stock and has the world’s most popular investor in Warren Buffett backing the name with big bucks. 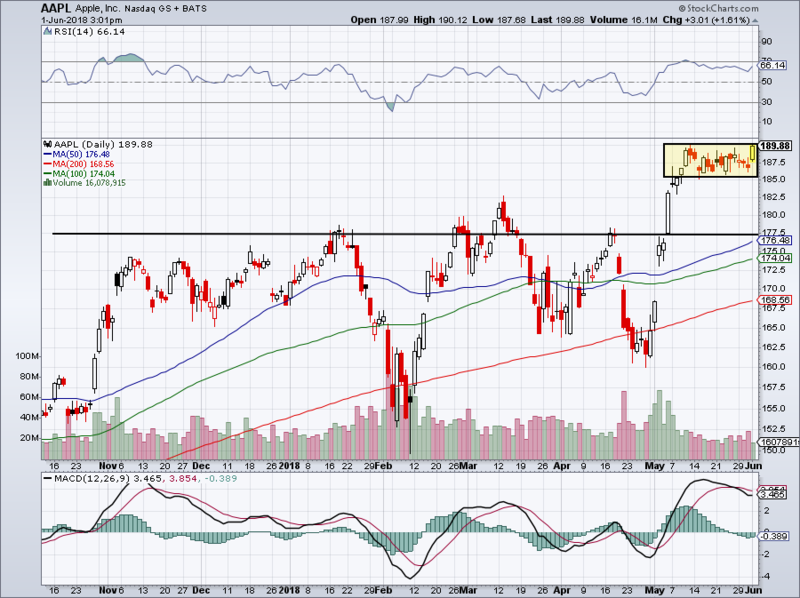 A breakdown rather than breakout likely sends AAPL down to $177.50 to $180 area. Bret Kenwell is the manager and author of Future Blue Chips and is on Twitter @BretKenwell. As of this writing, Bret Kenwell was long AAPL and IQ. Article printed from InvestorPlace Media, https://investorplace.com/2018/06/5-top-stock-trades-monday-morning-iq-aapl-amzn-twtr-lulu/.